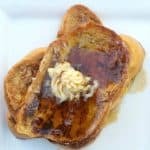 Eggnog French Toast with Maple Butter – delicious challah bread dipped in an eggnog batter, browned to perfection and topped with homemade Maple Butter. 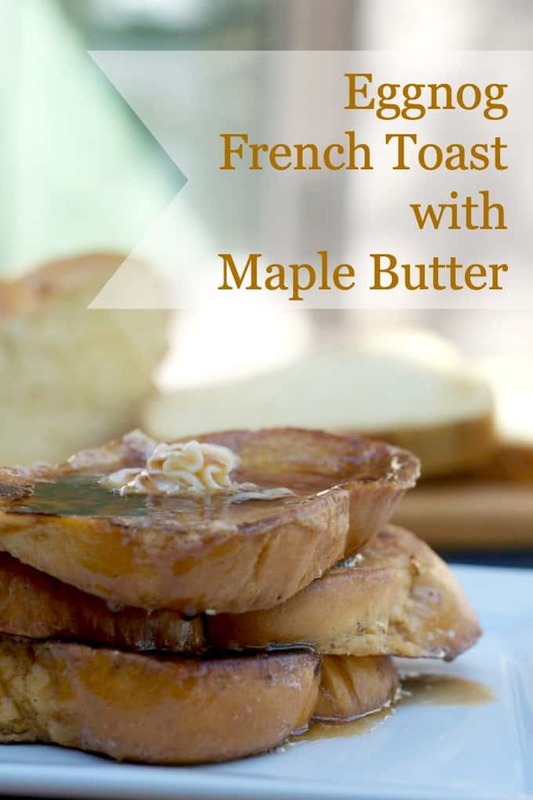 Finish it off with a drizzle of pure maple syrup and you’ve got yourself a breakfast treat that will delight your loved ones this holiday season. Yes, the holidays are upon us. Can you believe it? I mean, each year they come so very quickly! I so love the holidays because it means time spent with family and friends, and my favorite pastime, baking! Ever since I can remember, baking and the holidays have gone hand in hand. There was never a Thanksgiving or Christmas when there weren’t cookies, pie or some kind sweets on the dessert table. We often spent both of those holidays at my Grandmother’s, surrounded by family with the smells of cinnamon, vanilla and lots of delicious food filling the air. McCormick Pure Vanilla Extract is something I grew up with. There’s something comforting about that brown bottle with the red and white label sitting on the counter. It’s like an old friend and something that generations of women in my family have used, and no doubt will use for generations to come. Looks pretty darn good, doesn’t it? I look forward to holiday baking every year, and doing it with products I know are consistent in quality, have exceptional ingredients and will give my treats exceptional flavor that family and friends will not soon forget. It’s also quality time spent with my daughters and son, laughing, creating, and making memories to remember for years to come. Delicious challah bread dipped in an eggnog batter, browned to perfection and topped with homemade Maple Butter. 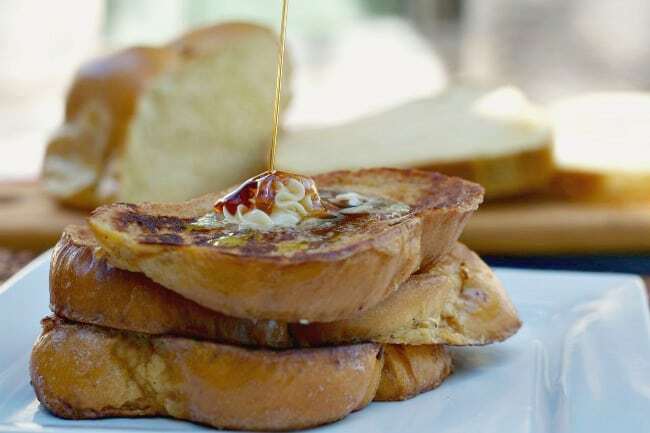 Finish it off with a drizzle of pure maple syrup and you’ve got yourself a breakfast treat that will delight your loved ones this holiday season. In a shallow bowl or baking dish, beat the eggs. Whisk in the eggnog, McCormick Pure Vanilla Extract, cinnamon, nutmeg, and salt. in a mixer fitted with the paddle attachment, cream butter until light. 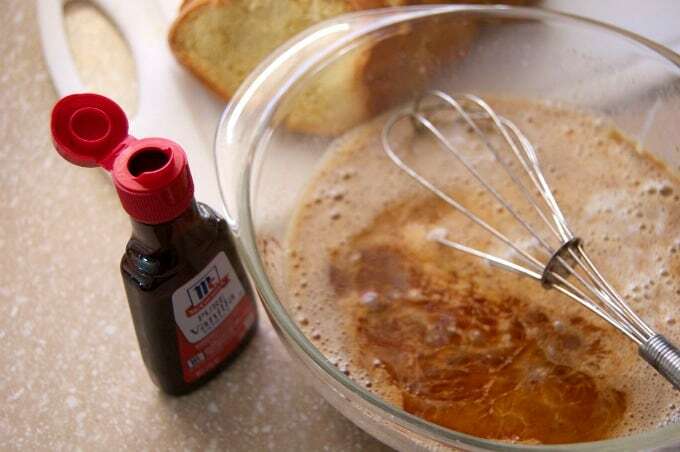 Scrape down the sides of the bowl and add the McCormick Pure Vanilla Extract and maple syrup. Preheat a skillet or griddle over medium-high heat. 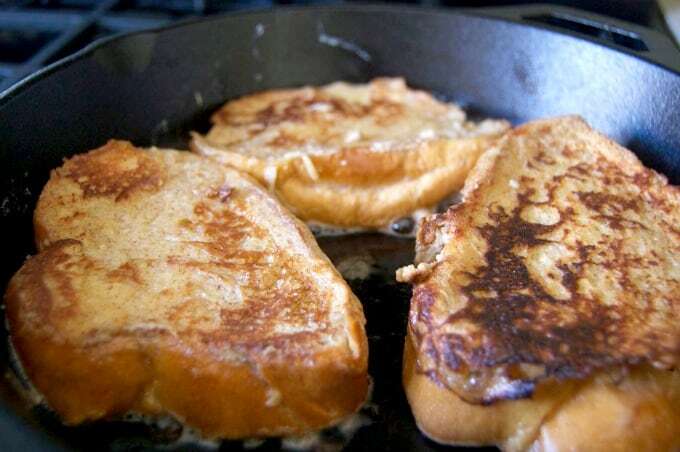 Add one tablespoon of the 5 tablespoons of butter to the pan / griddle to start melting. 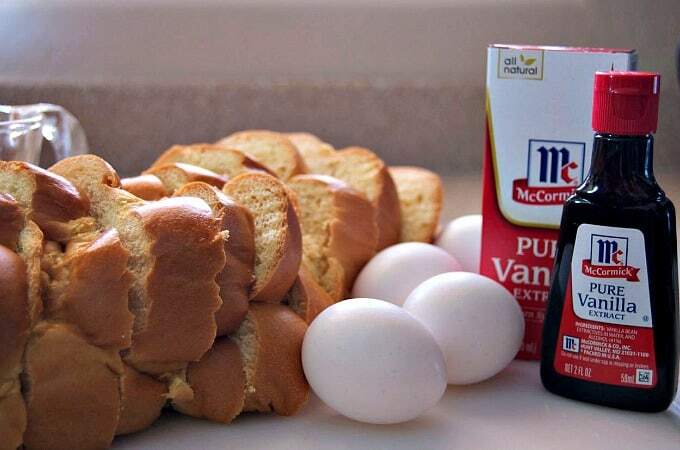 Take one slice of the Challah bread and dip into the eggnog batter for a few seconds on each side. Allow excess batter to drip off before placing into the skillet. Cook for 2-3 minutes before turning over to cook on the other side for an additional 2-3 minutes. 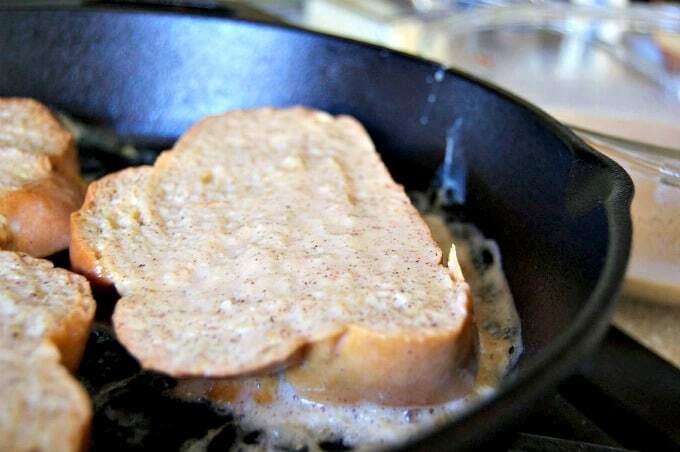 Repeat process by adding one tablespoon of butter to skillet each time before cooking remaining slices. Top slices with Maple Butter and pure maple syrup before serving. I rate everything I make on a scale of 1 – 4 with 4 being the best and this Eggnog French Toast with Maple Butter earned 4 rolling pins! This is not your typical French Toast! It is soooooo very perfect for the holidays with the eggnog and enhanced with McCormick’s Pure Vanilla Extract. It’s so festive and delicious that it’s sure to become a holiday tradition. Exceptional flavor. Exceptional aroma. Exceptional Ingredients. McCormick gives you premium quality extracts in a wide variety to encourage your creativity this holiday season! I know you’re going to have lots of fun with it!! Tell me, what products will you be using this year to make your holidays extra-special? This is a “sponsored post” and in exchange, I have been compensated by McCormick and Company with a monetary payment. I only endorse or recommend those products I personally use and feel will best benefit my readers. It is written by me and all opinions expressed are my own. Thanks, Melissa! I’m sure they will enjoy it! And as you said, you might even, too! This looks so so good! 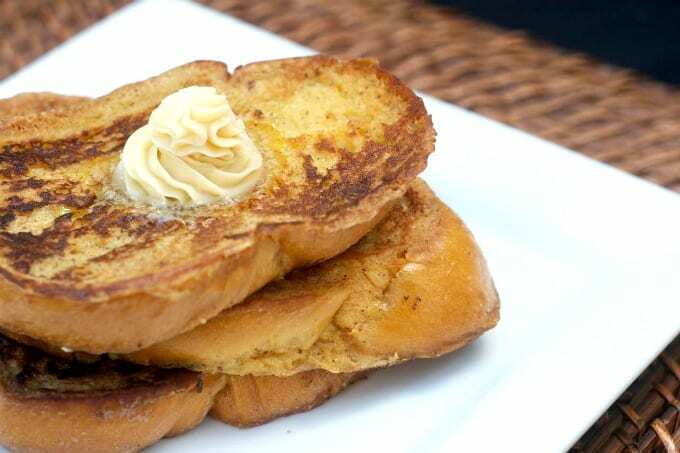 I love eggnog and french toast bakes are my favorite for weekend breakfasts.